The Brigantine Police Department recognizes the value and peace of mind that an alarm system can provide to a resident and business owner and assist them with safeguarding themselves and their property. Since the safety of the City’s residents and merchants continues to be of the upmost concern for the Police Department, it encourages all property owners to use their alarm system to its fullest. One issue facing the Department is the number of alarm calls that officers respond to each year. Since 2010, there have been 2,235 alarm activations, with 542 activations occurring in 2013. Although, there have been some occasions where a crime or other serious problem was thwarted because of an alarm system, the overwhelming majority of activations were found to be a false or accidental activations when the responding officers arrived. The Department recognizes that false alarms occur for many reasons; some of which are beyond the owner’s control, such as inclement weather conditions, however, the overwhelming majority of alarm activations were caused by human error or some other avoidable circumstance. Further compounding the matter is the fact is there are some locations in the City where officers have had to respond to multiple false alarms activations throughout the course of the year. The goal of this program is two-fold. First, reduce the number of the false alarm activations that occur thereby allowing the Department to continue to focus its resources in the most proactive and efficient manner possible. To that end, the Police Department would like to remind all residents and business owners to be mindful of the requirement for an owner to properly maintain their alarm system so as to avoid preventable alarm activations from occurring, which is outlined in Chapter 87 Alarm Systems of the City Code. Further, the Code allows for the property owner to be sanctioned in the event of repeated avoidable alarm activations. Second, the Police Department is attempting to overcome the challenge of not being able to notify the owner or caretaker of a property to alert them of an activation and/or issue that has occurred because no contact information is on file. Additionally, although responding officers check a property to the best of their abilities, many times they are precluded from checking the property completely because of barriers, fences, etc. that are encountered and they often cannot check the interior of the property where an issue may in fact be occurring but remains unseen from the outside. The Brigantine Police Department is asking all property owners to register the alarm systems with the Department by completing the Alarm Registration Form. The voluntarily registration process is free of charge and will provide the department with up to date contact information on the owner and a caretaker(s) in the event there is need to make a notification or have someone respond to the property. By having this information readily at hand, valuable time will not be wasted trying to locate someone, especially in the event that the homeowner is away and out of the area. 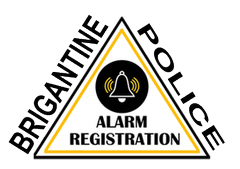 The Alarm Registration Forms are available at Police Headquarters or on line at https://brigantinepolice.org. Any questions please feel free to contact the Department.